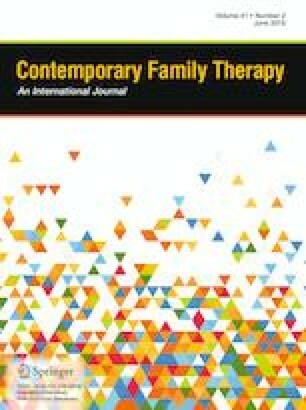 This article examines the professional identities of family therapists employed by Family Counselling Services (FCS) in Norway and their experiences providing therapeutic services to parents whose children are placed in public care. Through focus groups and individual interviews, a qualitative study of seven family therapists in FCS found that they struggle with contradictory positions when guiding parents due to the dichotomy between their personal feelings and theoretical background as systemic therapists. The struggle emerges when different systems indicate different versions of reality and when the therapists react to how the welfare system, in general, treats parents with such experiences. This study argues that a systemic approach to family therapy is useful both for dealing with parents’ often fragmented stories and for reconnecting parents to society by allowing them to tell their own stories. In these situations, the help offered by therapists is often inadequate for the complexity and enormity of the parents’ needs. Collaboration with other welfare institutions is particularly important in such cases, but this creates its own complications due to the fact that different actors interpret situations in different ways. The study was funded by VID Specialized University College in Oslo, Norway. Barne-ungdoms-og familiedirektoratet. (2017). Er du fratatt omsorgen for barnet ditt? Retrieved October 5, 2018 from, https://www.bufdir.no/Familie/Hjelp_til_parforholdet_og_familien/foreldre_fratatt_omsorg/. Bøe, T. (2015). Sosioøkonomisk status og barn og unges psykologiske utvikling: Familiestressmodellen og familieinvesteringsperspektivet. Rapport. Helsedirektoratet. Retrieved December, 2015 from, https://helsedirektoratet.no/Lists/Publikasjoner/Attachments/1045/Sosio%C3%B8konomisk%20status%20og%20barn%20og%20unges%20psykologiske%20utvikling%20IS-2412.pdf. Forrester, D., Westlake, D., McCann, M., Thurnham, A., Shefer, G., Glynn, G., & Killian, M. (2013). Reclaiming social work? An evaluation of systemic units as an approach to delivering children’s services. Retrieved June, 2013 from, http://hdl.handle.net/10547/594517. Weitz, Y. S. (2016). Föräldraskap på avstånd: Om socialtjänstens stöd till familjehemsplacede barns föräldrar. Forskningsrapport 2016:3. Stockholm: FoU Nordväst. https://www.fouvalfard.se/file/foraldraskap-pa-avstand.pdf.